As we say in Boston, "Stripahs ah wicked tasty." 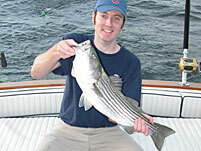 Striped Bass fishing is exciting and fun. This prized federally protected game fish is tough to catch, but when caught worth every moment of effort. The species has really made a come back over the last 20 years due to the federal conservation efforts. 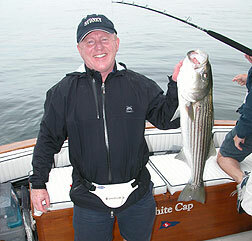 Now Stripers are the norm to catch versus the exception. Contact for Rates and Reservations. 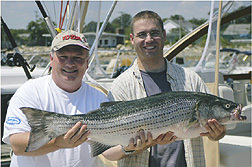 Striped bass are also healthy to eat and are a fairly good size: running up to as much as 50 lbs. The typical catch is 20-30 lbs. 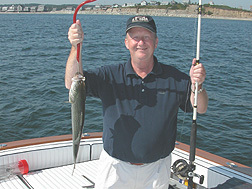 All gear and bait is included in this early morning charter out of Scituate, MA. Bass is subject to Federal and State catch limit laws. The limit is 2 per person per day with a curved fork length of at least 28" (Tip of jaw to fork in tail). Contact Captain Brad Toll Free at (877) 897.7700 to book your charter today!